I love this kind of signage...or maybe better said, I love his kind of illustration. It says...this is what we sell. No kidding. Doesn't it look good? Even if you cannot read, these little darlings tell you all you need to know on a hot day. Today, the news is in tidbits. A tidbit aside, Princess Kitty loves this word as it was the description of pineapple in the cafeteria at Fredonia. Somehow this has really appealed to her, so we are using tidbits as a word on a regular basis. Barack Obama's historic candidacy has sparked an unprecedented artistic outpouring. Now, in partnership with Shepard Fairey and his Obey Giant collective, we're offering a new way for artists—anyone with a pen and paper qualifies—to share their talents and help elect Barack Obama at the same time. It's called Manifest Hope, and it's a new Obama art contest for 2D and 3D art, from painting to photography to sculpture. The winners will be shown at the Manifest Hope Gallery online and in Denver during the Democratic convention alongside works from dozens of established and influential artists. But you need to get started soon. The final submissions deadline is August 18th at 11:59 a.m. ET. That's not much time to conceive and create a piece of art, so get started today. All submissions will be judged by a distinguished panel of judges—artists from Obey Giant, contemporary art curators, and multi-talented musicians. Finalists will be asked to auction off their pieces, and donate the proceeds to progressive organizations. Denver will be buzzing during the convention, but this gallery is going to be one of the coolest places to visit there. Plus, the gallery's going to have an amazing party with live performances by Death Cab For Cutie, Moby, and Clap Your Hands Say Yeah. 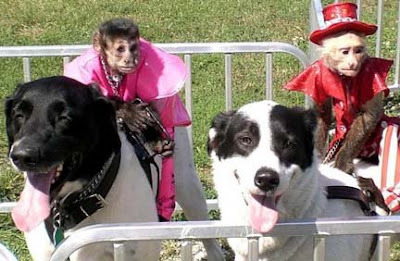 If you’ve ever wanted to see monkeys race while riding on the backs of dogs, here’s your chance (and yes, you read that correctly). The Banana Derby features spider monkeys as jockeys, costumes and all, racing on dogs as if they were taking part in a real derby. These half-hour shows are a new event at the Fair. Contestants dress their pigs, and themselves, to coordinate with the Fair’s theme: Summer Fun Headquarters. There will also be poultry, rabbit, sheep, goat and dairy dressing contests throughout the course of the Fair. I wonder if people dress to match their rabbits or sheep? Or Chickens? I would..hmmm...which one? Sheep def. We share the same dim look...eyes on the side of our heads...and a bad "meat head" perm might work. There are event that the name work for like "The Ultimate Night of Destruction" which captures one of my favorite sports, demolition derby, and takes it to a whole new level, one with buses. I only secretly hope there might be some bright yellow schoolbuses added to the mix to set every mother's teeth on edge (speaking personally) which paired with the concept of New York State might encourage us to pay more taxes for transportation. There is a really interesting marketing twist here. Just need to mull over that. We had a treat and saw the Black Knight last night. Great. So great, Kitty couldnt sleep. Lots of rain...but had a chance to bob in the water.